Finally, I did it or better said we did it. Already back in November last year I saw the big billboard advertisement of Skydive Austral Mauritius near Caudan Waterfront in Port Louis and decided for myself that this is going to be the perfect birthday gift for my wife. Simply out of curiosity I would join her tandem jump with a second instructor. Due to her pregnancy of our son I had to be patient... But then finally, her birthday had arrived and on our midnight celebration session I showed her her netbook with the website preloaded. Actually, it was the "perfect" timing... Recovery from her cesarean is fine, local weather conditions are gorgious and the children were under surveillance of my mum - spending her annual holidays on the island. The facilities at Skydive Austral Mauritius are complete except for food. Enough space for parking, easy handling at the reception and a lot to see for the kids. There's even a big terrace with several sets of tables and chairs, small bar for soft drinks, strictly non-alcoholic. The team over there is all welcoming and warm-hearthy! Having the kids with us was no issue at all. Quite the opposite, our daugther was allowed to discover a lot of things than we adults did. Even visiting the small air plane was on the menu for her. Really great stuff! 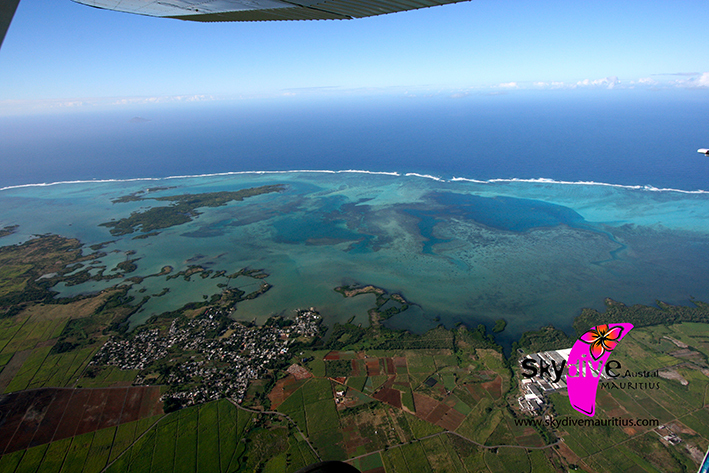 Image courtesy of Skydive Austral Mauritius - roughly 10.000ft above sea level. First, we got some information about the procedures on the plane about how to get seated, tight up with our instructors and how to get ready for the jump off the plane as soon as we arrive the height of 10.000 ft. All well explained and easy to understand after all. Next, we met with our jumpers Chris and Lee aka "Rasta" to get dressed and ready for take-off. Those guys are really cool and relaxed for their job. From that point on, the DVD session / recording for my wife's birthday started and we really had a lot of fun... The difference between that small Cessna and a commercial flight with an Airbus or a Boeing is astronomic! The climb up to 10.000 ft took us roughly 25 minutes and we enjoyed the magnificent view over the turquoise lagunes near Poste de Flacq, Lafayette and Isle d'Ambre on the north-east coast. After flying through the clouds we sun-bathed and looked over "iced-sugar covered" Mauritius. You might have a look at the picture gallery of Skydive Mauritius for better imagination. The moment of truth, or better said, point of no return came after approximately 25 minutes. The door opens, moving into position on the side on top of the wheel and... out! Back flip and free fall! Slight turns and Wooooohooooo! through the clouds... It so amazing and breath-taking! So undescribable! You have to experience this yourself! Some seconds later the parachute opened and we glided smoothly with some turns and spins back down to the dropzone. The rest of the family could hear and see us soon and the landing was easy going. We never had any doubts or fear about our instructors. They did a great job and we are looking forward to book our next job. I might even consider to follow educational classes on skydiving and earn a license. By the way, feel free to get in touch with Skydive Austral Mauritius. Either via contact details on their website or tweeting a little bit with them. Follow the tweets of Chris and fellows on SkydiveAustral. how to setup, configure and use 3G/UMTS connections on Linux here in Mauritius. Personally, I can only share my experience with Emtel Ltd. but try to give some clues about how to configure Orange as well. German company BvL Bürosysteme Vertriebs GmbH bought all rights of Active FoxPro Pages from the insolvency stock. Together with their partners Christof Wollenhaupt and Jochen Kirstätter BvL will continue with development, support and marketing of AFP in the upcoming weeks.